Have you ever watched a short film and wondered, “How did they do that?” There is no doubt that producing a film of any kind takes a lot of skill, practice, patience and time. A scene that comes on for one minute may have taken one day to get it right. Dedicated crews put in a lot of hard work in order to make a short film that is finally viewed by the audience. Keeping it all together are the visionary directors and producers who are working just as hard to bring shorts fans another quality film to watch. Upon entering the stage set, there were multiple activities going on at the same time. 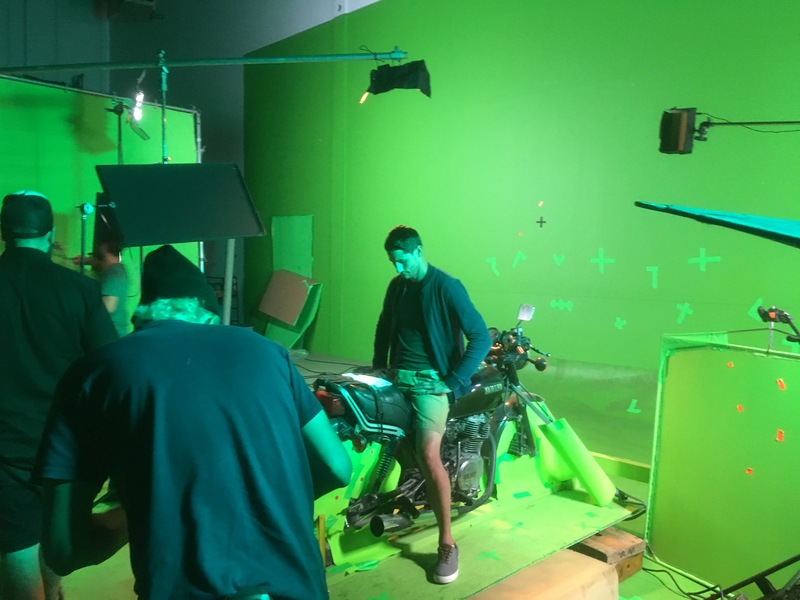 Crew members were busy positioning the motorcycle and attaching green material to it before the scene could be filmed. At the same time, Steven was having make-up applied to his head by the make-up artist while waiting in the wings for his cue to come on to the set. Other crew members were making sure that the all lighting was properly adjusted and that all the cameras that were being used were angled and ready to roll. 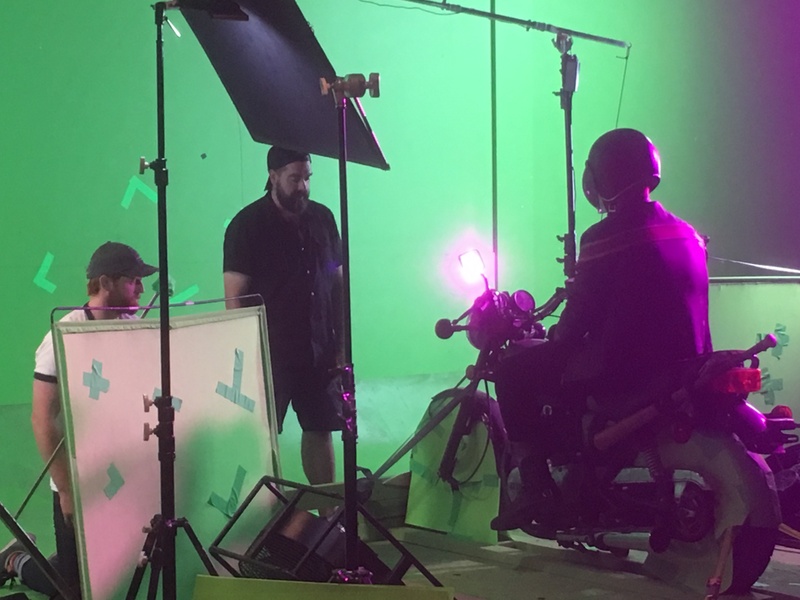 Of course, BJ was there providing instructions and coaching everyone on what needed to be done for the filming of that particular motorcycle scene. It was a noisy and busy atmosphere that many short film fans don’t have the opportunity to see every day. Many thanks go to BJ, Brad Crawford and the rest of the crew for allowing Short Film Fan onto the set for the chance to learn some basic filmmaking techniques and for this sneak-peak into ‘Patterns’. As of writing, ‘Patterns’ will be set for its finished post-production in the middle of January 2018. We’re almost at the end of 2017 and it’s been a very good year for Short Film Fan. The number of visitors and views has increased over last year, while new subscribers have signed-up. Also, more filmmakers (from Canada as well as beyond) have reached out to submit their short films to be reviewed. More film festivals were connecting with the site, as well; in one case this fall, Short Film Fan was an official media partner of the Toronto Shorts International Film Festival. This is all so incredibly encouraging and motivating. It’s an indication that Short Film Fan’s delivery of news, reviews and information about Canadian short films is hitting a positive chord with you in one way or another. 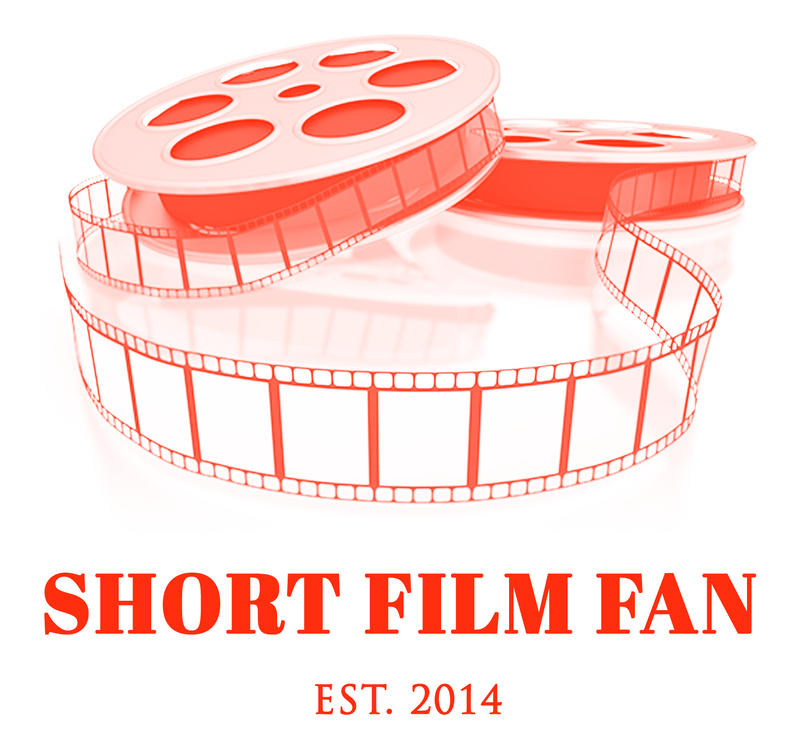 As the creator and publisher of Short Film Fan, it’s my duty to take a look at where the site is now and where I’d like it to be in the future. As you may know, time spent on each Short Film Fan post is done outside of my regular daytime activities. This fact makes it sometimes difficult to keep up with the increasing volume of article ideas and submissions. Tied in to the time spent on working on posts is the monetary cost of maintaining this site. How to find more hours to work on more posts in the most cost-effective way is one priority for me. Also under review is the structure or format of each post. Currently, all of the articles on Short Film Fan are written either by myself or a dedicated volunteer. While some blog sites tend to lean heavily towards text, others have incorporated more audio and/or video in their articles. How to improve the readability of future articles is also an important priority. Please fill out this survey no later than December 15th, 2017, 11:59 p.m. Central Time. After this date, all data will be reviewed and analyzed to get a clearer picture as to how the site should progress. 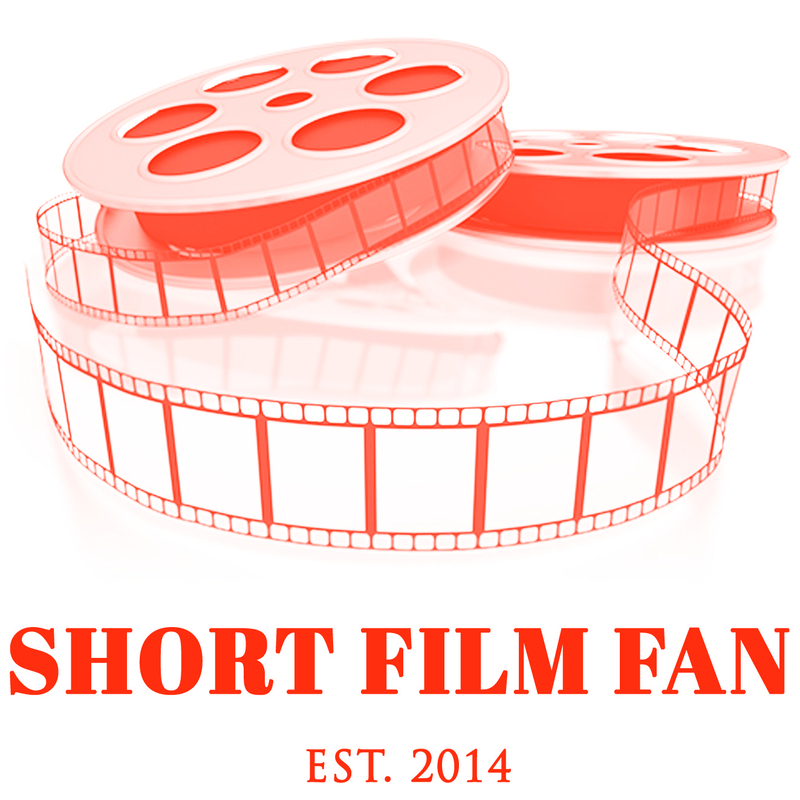 I look forward to reading your thoughts and opinions about Short Film Fan. Thank you for your participation and continued support. Watching a short film can be a temporary stress reliever. For a little while at least, the viewer can absorb him or herself into whatever short they have selected and their worldly cares quickly go away. String a few of them together and you have made a little short film festival that can help you to relax, have fun and take your mind off of things for the time being. But, what about those who suffer stress as a disability, such as complex post-traumatic stress disorder (c-PTSD)? What if you are the filmmaker, not the viewer, who needs help with managing this disability? Where and how do you reach out for help? Toronto-based filmmaker, actress, curator and speaker Lisa Anita Wegner can shed some light on this serious matter. Lisa is the founder of Mighty Brave Productions/Haus of Dada and the co-founder of Akhilanda Collaborative. 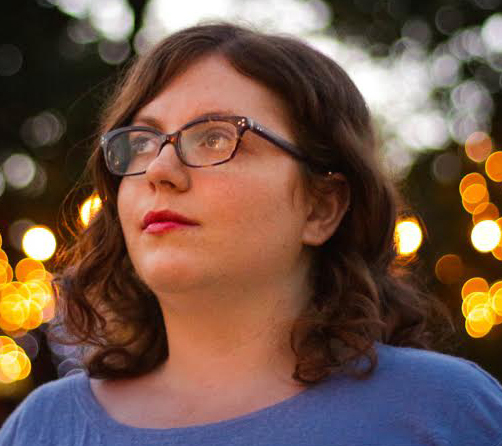 Since using filmmaking as therapy for her c-PTSD, Lisa’s film production has doubled and her career has taken her into new directions with considerable screenings of her films in Arizona. 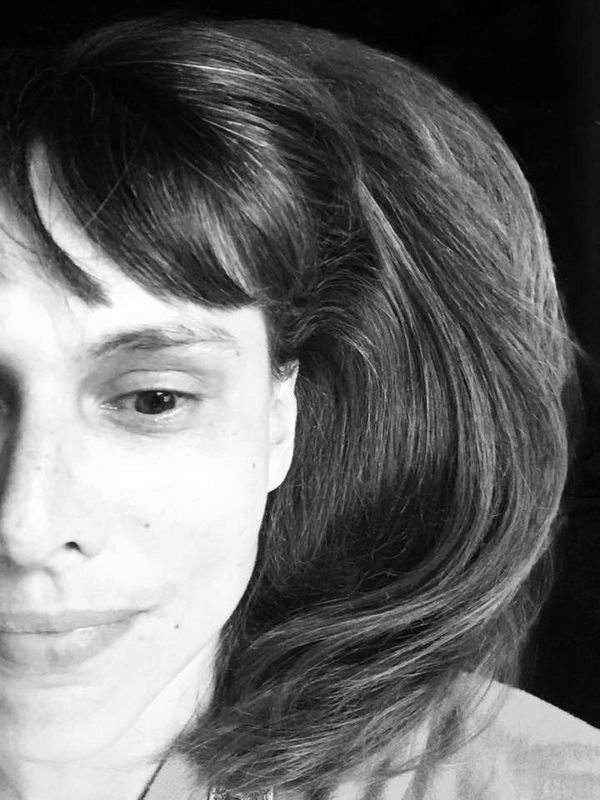 Short Film Fan reached out to Lisa to learn more about how she has used short filmmaking to manage her c-PTSD. Below, she describes in her own words her personal journey. Short Film Fan: Who or what influenced you to become filmmaker? Lisa Anita Wegner: I was a shy kid who lived in Toronto with my German and Austrian immigrant family. I remember not understanding English and being really nervous out in the world. I found comfort first in my dressing up and imagining myself as other characters like Wonder Woman, Laura Ingalls, Mary Poppins and Lil’ Orphan Annie. After a while, I wanted to perform these inner imaginations and started doing plays where I needed more kids and sometimes adult help. I got together a neighbourhood Mary Poppins play in kindergarten. In grade two, I asked my school principal to use part of our class time for rehearsal and arranged it so that we would perform Annie in the auditorium. When I had a project, I was fearless. Kids who had no interest in me otherwise wanted to be in my plays. It felt like I was doing the right thing. All through school, I continued to produce plays with whatever resources I had. I also acted in school and professional plays, eventually touring nationally as an actor with English Suitcase Theatre. I really felt the most whole when I was performing. I kept acting in film and TV and literally never stopped creating my own projects. SFF: Can you tell us a little bit about your work in the early days of your career? LAW: Around the turn of the century, I had a revelation: the filmmaker shows the audience where to look. It’s so intimate because you have the audience’s eyes. That blew my mind. I wasn’t a kid who grew up with a video camera, so I started looking for film directors to collaborate with when I started Mighty Brave Productions. At that time, I didn’t generate my own content; I needed the input of writers, directors, editors and cinematographers. I had final say on every aspect of a production, usually with the director. I also worked as a TV and film actress in Toronto and Montreal. I was running a small production company known for my comedic work and I was fiercely proud, I was sure I was on the right path. 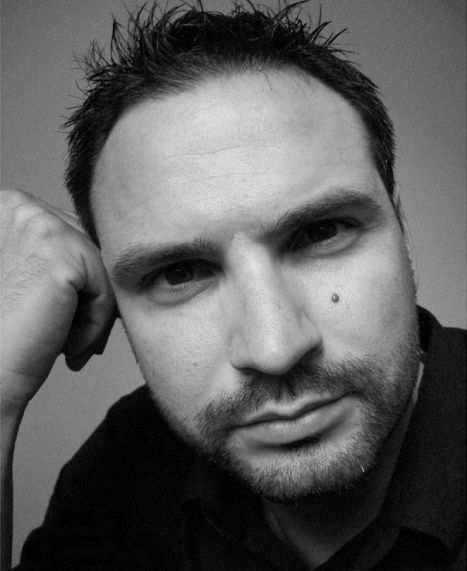 SFF: In 2009, something happened to you that affected you and your filmmaking career. Can you describe to us what it was and what challenge or challenges it posed for you? LAW: In May 2008, I went to the Cannes Film Festival Short Film Corner with my short, The Gospel of Phi. I had known there was something wrong with me for a while, but I had put 200% effort getting ready for my first European film festival. So, I thought I was just exhausted. Once in France, I found myself completely unable to function or communicate properly. There was something very wrong. I only left my rental accommodation to unsuccessfully get juice. I flew straight back to Toronto without getting to the festival and thought I just needed a few months rest. When I got home, things got worse and for over a year I wasn’t able to get out of bed and was overwhelmed by the smallest task. I slept about 20 hours a day and I felt like my brain had gone offline. In 2009, I was diagnosed as having complex post-traumatic stress disorder. Later that year, I started receiving help from Women’s College Hospital and started receiving Ontario Disability Support. SFF: Who or what encouraged you to make short films as part of your therapy? LAW: From 2008-2011, I spent most of my time in bed with my dog and my laptop. Communicating anything was really hard, and my friends and colleagues were worried about my silence. I used images of myself shot with my webcam first of all to figure out who I was; I genuinely was not sure who I was at that point. I posted these to feel more real and reach out to my friends on social media. Communicating artistically was my go-to mode of expression and making things out of the footage was how I got through my hours awake. When I was at The Gerstein Centre and Women’s College Hospital’s SPEAK ART program, I was also encouraged to make art and videos to move forward. Artistically, it was pure communication; I was at a loss for words so film images were how I communicated with myself and my friends. These weren’t originally made to be seen by the public. One of my social media friends was Steve Weiss, a film programmer who screened my previous work. He invited my short film so who am I anyway to Selections 2011 at The Phoenix Art Museum. Eva Gets a Better Job was also screened later that year at The Herberger Theatre Centre. This was the ultimate encouragement that people in the film community wanted to see this therapeutic work. Steve then arranged a screening and a talk for me at Short Film Bar, and it was the first time I spoke publicly about how art saved my life. For the first time, I felt like an artist and not someone who couldn’t get out of bed. Now I can’t stop making work like this. Without access to film equipment, I use my laptop or my phone. Without power, I paint, draw or collage. There is an unstoppable well of stories in me busting to get out in many formats. Through all this creating, it’s obvious to me that at heart I’m a performer and a filmmaker. SFF: How has producing short films helped you with c-PTSD? LAW: My daily art practise keeps my c-PTSD symptoms at bay. Living with a stress disorder, I must arrange my studio days to be as stress free as possible. I continue the intuitive process of creating on my feet and I film it as I go. Editing is where I find the moments that interest me. I have used a blue screen studio donated by Mary-Margaret Scrimger (from Akhilanda Collaborative) and most days, I create bite-sized photo and video content. If there is value in a bite-sized project, I tend to take more bites. Most of my current work comes out as performance, photo and video sketches; however, some of these turn into full-grown pieces. It’s really the creative output that is my therapy. I work largely on my own or with interns. With my imagination primed and focused, my therapeutic workflow is smooth and familiar and is now turning into a body of work. The producing and getting the work out into the world is a benefit I am now enjoying, but it’s the content creation that helps my PTSD. SFF: Can you tell us more about your short film, The Way Back Home? LAW: Kirsten Leila Edwards curated a MASH UP Art Party for the Hercinia Arts Collective in the winter of 2015. I was matched up with The Aerial Mermaid Clone Army which was Ashley Hurlock and Tamara Arenovich, two aerialists who performed as mermaids. In a few short collaborative meetings and rehearsals, we had come up with a live multimedia performance of three mermaid sisters getting lost in a storm called The Way Back Home. We had the privilege of performing it multiple times live in Toronto. With the addition of Pink Moth (Ray Cammaert) making music and a third aerialist artist Mary-Margaret Scrimger, we formed Akhilanda Collaborative. Mary-Margaret brought the blue screen studio into the mix and donated the space to shoot. As the project developed, I felt it was strong enough to work as a short film. It premiered at the Mesa Art Centre season kick off in Arizona on September 8th, 2017. SFF: Would you recommend short filmmaking to others in your field who may be experiencing similar health issues? LAW: The reason it worked for me is because visual storytelling is coursing through my veins. When my regular cognition wasn’t working, this form of communication kicked in. I couldn’t complete a task, shower, dress or eat much, but I could stand up from my sweaty bed, and shoot, edit and post relatively complex video pieces. I recommend any form of expression that feels natural and comes easy to the individual as therapy. Because film is so technically easy to shoot and edit now, it is a viable option for anyone. I encourage folks not to be overly concerned with the content as then it leaves the therapeutic realm. I know that’s hard but just keep making stuff. SFF: What new short film projects can we look forward to seeing you in next? LAW: Last month, I completed my first film commission entitled Life on Mars with Thin(k) Blank Human with Barton Weiss Productions in Arizona. It was created for a particular Phoenix Arizona art installation that has not launched yet. There will be an artist talk in Toronto in the winter and Canadian screenings will be announced. This was the first time that my performance persona Thin(k) Blank Human was written for and directed by anyone else. The creative process started in Arizona with backgrounds created and photographed by Rick Tashi. It was scripted in Phoenix and all the performances were shot by me on the blue screen in Toronto. A super fun creative project to have the freedom to play on Mars! I’m also finishing a short documentary, Being Inside the Glacier II: Further Conversation, the second chapter documenting the performer experience in Anandam Dance Theatre’s performance GLACIOLOGY that was in Toronto’s Suit Blanche in 2015. And, I’m starting to edit another Akhilanda Collaborative short film about fed-up aerialist French maids. And my ongoing project The Fictitious History of the Haus of Dada has chapters added on a regular basis. SFF: What is your most favourite film project that you ever worked on, short or feature? LAW: If All You Have Is a Hammer, Everything Looks Like a Nail is a triptych film made by Will Kwan for the Reel Asian Film Festival by Gendai Gallery. In 2013, Shannon Cochrane of FADO sent me the audition information about Will Kwan’s film. This was the first time since my diagnosis that I had an audition for a narrative scripted film. Working again with my union, I was cast in a meaty role with 16 pages of dialogue. Without a rig, I’d be driving myself while doing these monologue style scenes with actor Michael Man. I used to have a specialty of learning lines quickly. It came easy and I worked really hard at the same time. I wasn’t sure how my c-PTSD would react to the stressful tasks of memorizing and shooting. The shoot days were scorching hot and we couldn’t have the air conditioner on because we were recording sound. After a few shots, I realized I still had this acting skill set; I was able to drive the car as needed and deliver take after take with accurate dialogue and craft a character for film. Once I realized this, I had the most fun with the rest of the shoot and really enjoyed acting again. If All You Have Is a Hammer, Everything Looks Like a Nail was commissioned for a project called Model Minority. I played a real estate agent who is that kind of privileged white lady who claims “we’re not racist [here in Canada]” while saying a slew of inappropriate things. Embodying this character was interesting, as this is a type of racism here in Canada that needs further examination. Will’s film has been screening in galleries since opening and is currently running until end of November at the University of Toronto Art Gallery at Hart House. 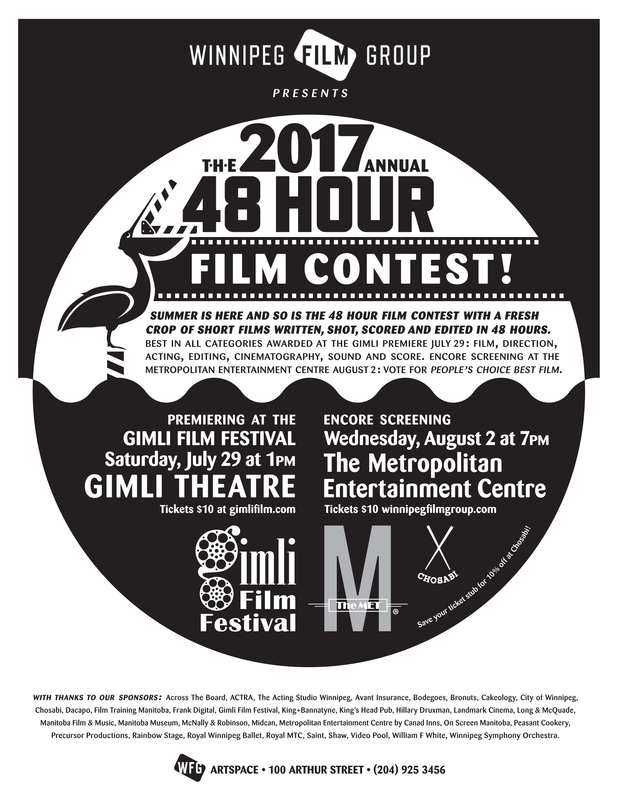 SFF: Based on your experiences, do you have any advice for any short film producers in Canada? LAW: Most filmmakers are keen to make one short film as a calling card and move on to feature films. A body of work that represents the filmmaker is so important to have a lifelong career. And it is the time without executives, where you have full creative control. Enjoy this! Shorts are an elegant, economical way to tell a story and see the benefit of this medium in our current impatient cultural climate. I’d say, never stop making short films. Figure out exactly what kind of film it is you love, and then keep making it. When a filmmaker complains about the industry, saying they have made one short film and nothing happened, I say make twenty short films over five years and I guarantee something will. The final episode of the 10th season of CBC`s Short Film Face Off was broadcast on July 29th and it all came down to three excellent filmmaker finalists waiting to hear who the winner was of a handsome $40,000 film production prize made possible by Telefilm Canada and William F. White International. 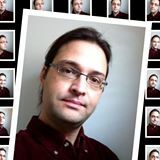 New this season, William F. White contributed an extra $2,500 to each runner-up. On tonight`s episode, the viewing audience had one more chance to see Roman Tchjen (Parent Teacher), Renuka Jeyapalan (A Bicycle Lesson) and Koumbie (Hustle & Heart) all reassembled onstage before the big winner was announced. Season 10 SFFO Finalists With Panel. After each short was rescreened, Telefilm Canada’s Francesca Accinelli and host Steve Patterson presented this year’s $40,000 filmmaking prize award to Koumbie. Congratulations, Koumbie! Congratulations also goes out to Roman and Renuka for each picking up $2,500 from William F. White. You can catch all of this season’s episodes and films at http://watch.cbc.ca/short-film-face-off/season-10/d611d09a-6397-4a86-a91b-7632cfe86a9a. It is hard to believe that another season of Short Film Face Off has come and gone. It felt like the contest had just started last week. This is perhaps a testimony to the amazing caliber of short films that were in this year`s competition. Watching a short film can be compared to reading a short story, and the shorts on this year’s Short Film Face Off prove that Canada is truly blessed with creative and skilled storytellers. Timeliness and relativity in their content can also make short films attractive to an audience, and this season’s featured short films certainly had no problems with reflecting the rich diversity that makes up Canada`s population. Rest assured that after watching this 10th season of Short Film Face Off, Canada`s filmmaking and storytelling future is in very good hands. Looking forward to Season 11! 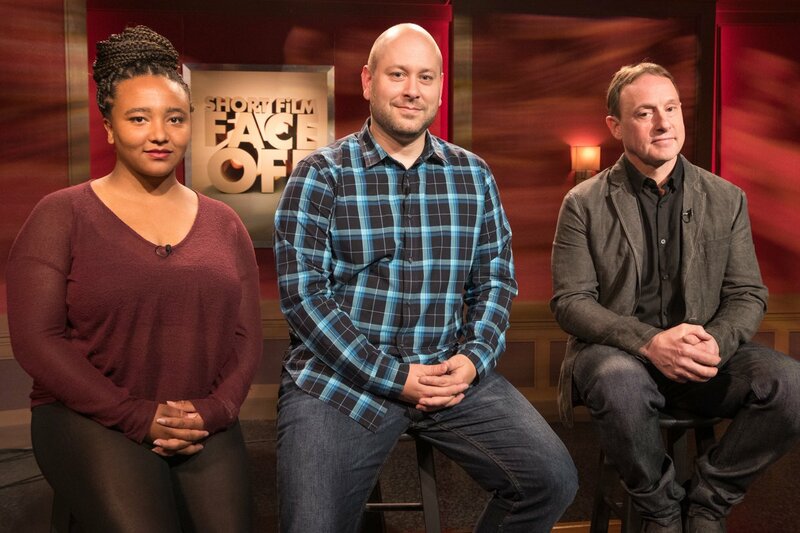 The third installment of Short Film Face Off‘s 10th season aired on July 22nd. 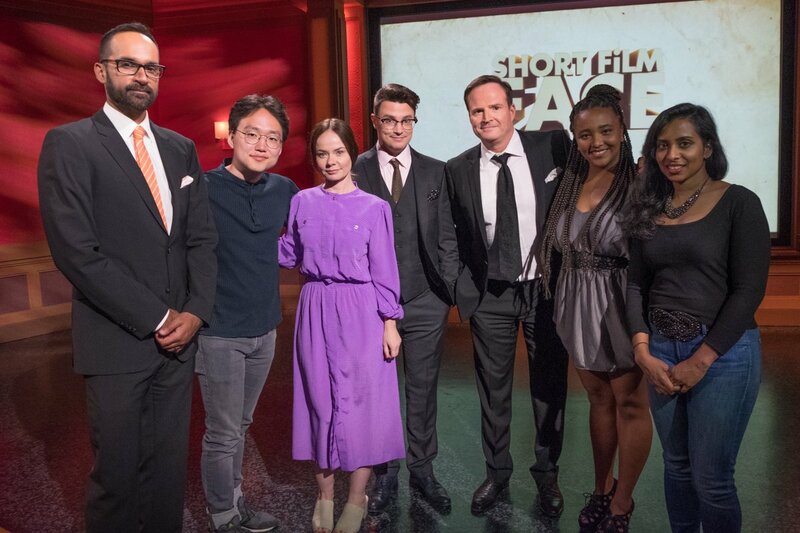 Three more filmmakers hit the stage in their quest to take home a $40,000 film production prize made generously possible by Telefilm Canada and William F. White. Viewers were also asked to cast their ballot for the winning film, which will be announced on next week’s season-closing episode. Tonight, Koumbie was first up with her film, Hustle & Heart. Mike Fly’s short Come To Bed was next followed by Noel Harris’ Touch. Hustle & Heart looked at the relationship between two football players; a frustrated couple argues about a weeknight routine in Come To Bed; a single mom in Touch needs a babysitter for her kids so she can go to work and avoid being evicted. Hustle & Heart garnered 12.0 points to advance to the final, while Come To Bed and Touch tied at 11.5 points. Hustle & Heart was a good insight into the stresses and fears that could potentially happen when an attraction to someone is not reciprocated by the other. The friend who rebuffed the advance handled the situation well, considering that the two friends played in a macho sport like football. Come To Bed was a cheeky poke at how routine a couple’s life can get. It was funny to see the husband/boyfriend speak in frustrated garbles and there was a nice nod to today’s technology when the wife/girlfriend suggested he look at his ‘Fitbit’ instead of his watch. Touch was an intense examination of poverty and family. It was hard to see the mother struggle with trying to find a babysitter, but it was gratifying to see her get help in the end. It was at first difficult to determine what the man’s relationship was to the family, but the daughter made it clearer later on. The caress of the girl’s back by the uncle was a bit tough to watch and was of some concern with the show’s panelists Mohit and Nadia. However, Noel explained his backstory to that scene very well. In the end, the caress could be seen as an uncle’s affection for his niece as he faces an uncertain future the next morning. For the next 24 hours, you can vote for the short that you think should take the prize by going online at http://shortfilmfaceoff.isivote.com/ or by calling 1-877-876-3636. Short Film Fan’s Prediction: With three films that were powerful and well-made in their own right, it is difficult to pick just one winner. However, Short Film Fan predicts Renuka Jeyapalan’s A Bicycle Lesson to win next week.